Definitive reirradiation of thoracic cancers with IMPT can provide durable local control with minimal toxicity and can extend survival. Recurrences of lung cancer are particularly challenging to treat, especially as many patients are not good candidates for surgery. Accumulated doses of radiation to essential organs and tissues near tumors can also limit the application of curative radiotherapy in patients who have previously undergone radiotherapy. In this retrospective analysis, researchers examined records from 27 patients who underwent reirradiation with IMPT for recurrent thoracic cancers (93%) or sequentially after a course of thoracic stereotactic ablative radiotherapy (7%). These patients were prospectively enrolled in clinical trials between 2011 and 2016. Median IMPT dose was 66 EQD2 Gy (range, 43.2-84 Gy). 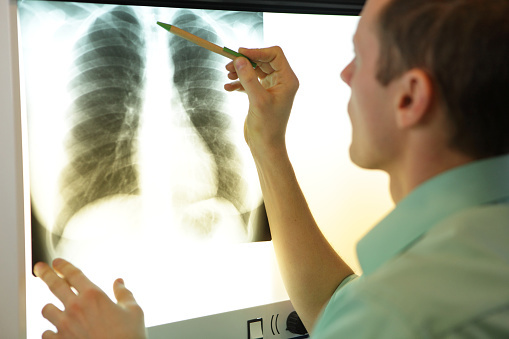 Most patients were treated for non-small cell lung cancer. Median time to reirradiation was 29.5 months (range, 0.1-212). Median time to follow-up was 11.2 months for all patients and 25.9 months for patients still alive. Median overall survival (OS) was 18 months, and 1-year OS was 54%. The 1-year progression-free survival (PFS) rate was 51%. Patients who received 66 EQD2 Gy or more had improved rates of 1-year PFS over patients who received smaller doses (76% vs 14%, respectively [P = .050]). Only 2 patients (7%) experienced late grade 3 pulmonary toxicity, and no patients experienced grade 3 or higher esophagitis. No grade 4-5 toxicities occurred. Ho JC, Nguyen QN, Li H, et al. Reirradiation of thoracic cancers with intensity modulated proton therapy. Paper presented at: 2017 Multidisciplinary Thoracic Cancers Symposium; March 16-18, 2017; San Francisco, CA.